What is Twitter? What’s that good for? How does that work? …. “But I don’t want to tell you everything about myself… that doesn’t matter anyway… it’s just nonsense… I can’t do anything with it…” > Questions and sentences I come across very often. I myself have been watching Twitter for over a year before I registered there in February 2009. To my question at that time: „How does it work?“ I got the answer: „You will only understand this when you have written 1000 tweets“ – at that time an unimaginable number – or period of time. Currently I have written more than 14300 messages, shared more than 1400 pictures and am quite happy about more than 3200 followers. In other countries this is completely different! 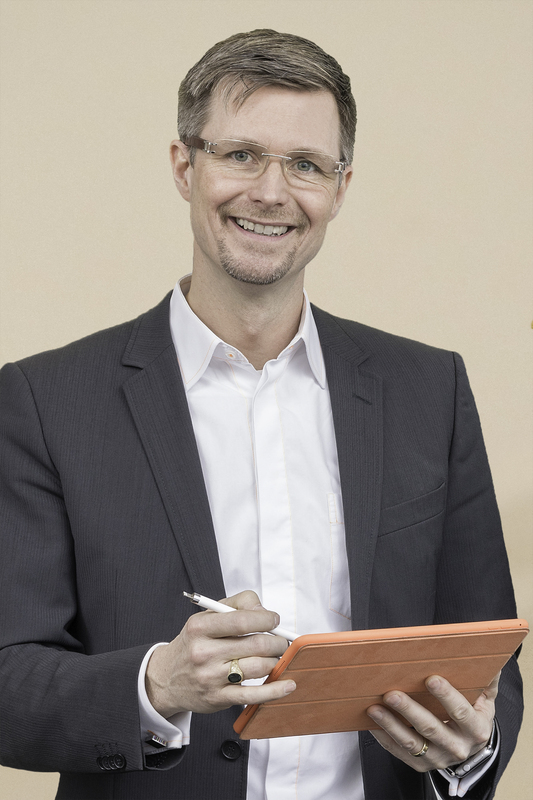 Quality country Germany would always like to understand, analyze and have things „ready“ / perfect before being published – this is our great success on the one hand – but in many areas it is increasingly slowing down our innovation. In the beginning of Facebook, Twitter and Co. our known media representatives (radio and TV (public law!) have made fun of this new channels and it’s content. Our politicians and associations have also made generous reference to dangers and all the negative aspects – some of them with a large drum roll – „finished their participation“. Today, hardly any journalist can afford not to use these services – especially Twitter. There is simply no faster and more direct news medium(this does not exclude investigative journalism, of course). Social media = cat videos = waste of time? Timeline – chronologically sorted tweets of the users you follow – similar to the eMail inbox, but without any effort – the messages are continuously running through, archiving, organization or deleting is not necessary – or not possible at all. Handling of spam, nerve saws or harassment in order to protect your personal data. Geo-data can be entered as well – this makes it possible to see where you are at the moment. Most important technologies are HashTag, @mention, ReTweet, private message, lists. Civil protection uses Twitter to organize „in chaos“. Town councils use it in connection with the geodata to get broken street lights, damages etc. quickly reported. Can also be used as a digital notepad, task list, link management, logbook (e. g. for my wood heating) or „diary“…..
Also to get in direct contact with VIPs or personalities, and companies. 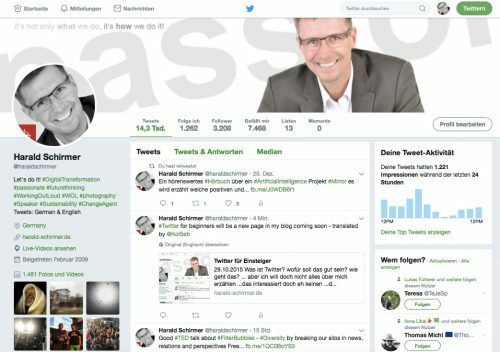 You can also integrate Twitter as a public news service into your own blog or website – here e. g. „What others write about me“: (of course it is much more exciting for a company, a product or an event). Registration – you have to register like with any other platform. Build a network – start to follow interesting people, or click on hashtags and find users who talk about it in a worthwhile way. Wondering why none of the 330 million users react… although you have „published“. What does a good personal network do? With 500 million tweets per day, the question is not whether you should read them all – like your eMail inbox. So it’s about getting what you want to read, without getting too much of the uninteresting. But since the tweets „flow“ all day long, it makes sense to understand how relevant news „comes to me“. With every user you follow, the number of messages in the timeline increases. In the beginning it is surely possible to read „all tweets“ there. As the number of people you follow grows, a mechanism begins to work that makes it possible not to have to read everything anymore, but to still receive the „relevant“ news – no matter when they were written (within a period of time – depending on the topic 1-2 hours or days) – by constantly re-tweeting important news items, they are brought up again and again over a longer period of time. On the one hand, the network takes over an important „filter function“ – but at the same time it also provides relevance through re-tweets and likeness. However, all messages are always available and can be queried directly via the author’s profile or the search. As soon as you become more active, you will look for various tools or plugins that add value. APIs are interfaces that can be used to automatically fill Twitter. Thus it is possible to create a new content (a video upload, a post or a photo) in various other social networks (Facebook, Flickr, WordPress, YouTube etc.) – to have it created automatically as a small advertisement with a suitable link on Twitter. Tweetsmap.com shows where the followers come from and who doesn’t follow. It doesn’t have to be limited to the virtual world. With services such as IFTTT you can create small processes without any programming knowledge – e. g. If someone in my area writes something about thunderstorms in Twitter, the roof window should be closed via home automation, for example, a warning lamp should light up or the shutters should be closed. In the animal kingdom, transmitters with GPS receivers are used to track animal migrations, or the presence of sharks in certain areas, for example – the „animals“ continuously twitter your location, or during special events such as photos. There are products, that publish (anonymously) their data to Twitter in case of problems or shortly before failures to enable manufacturers to provide quality assurance and service. Twitter is a SOCIAL network – meaning that all the rules in our physical world apply to the virtual world as well. Anyone who is polite, authentic, concrete and courteous, appreciates (like), appreciates (retweet or comments) others or values their contributions will be a welcome member. There is no obligation to publish anything! Each tweet, each photo is thus an individual decision – and an option – whoever enters the social media can thus slowly and cautiously take the first steps and gradually reveal what is perceived as „pleasant“ or making sense. If others write something about one or upload photos without being asked, there are still the usual channels or the personal conversation in which you can address and clarify this. Stupidity: Whoever writes „everything“ about himself, posts photos and knows no boundaries – will fall on his nose sooner or later – but this has nothing to do with Twitter. Whoever goes to strangers and tells them about his great TV and when he is on holiday…. Ignorance about technical possibilities – face recognition, cookies, passwords, mandatory data…. The high transparency of social media always creates a tension between the valuable service you get and the privacy you loose with it. It is therefore always necessary to weigh up the value of these losses – and this is not easy, admittedly, if you cannot estimate the benefit – and it is all the more important not only to be tempted by mere comments, but also to learn to be able to judge for oneself – there are many sources of help and acknowledged sources for this. For me personally, Twitter has become a useful tool with which I can quickly and easily get to know and contact many interesting people, do some advertising for my ideas, exchange thoughts, get feedback, test relevance and also build up my online identity or reputation. I find Twitter particularly valuable at events, in order to record my notes and thoughts on site, to get to know people and to quickly research backgrounds – or to process my notes and those of others into a compact image in the post-processing (currently withStorify – unfortunately they will stop their service soon). It’s also a great and easy way to express my appreciation of others for their work, which is especially helpful in the Working Out Loud #WOL concept. That everything is free for me and all over the world. As they say – it always depends on which animal you feed – I have chosen the positive one – and I look forward to seeing it come back on many occasions. for his translation of my original article from 2015.